Yippee and Yeee-haw! Kids and adults will have a rip-roarin' time trying to lasso the bull's head in this new game! 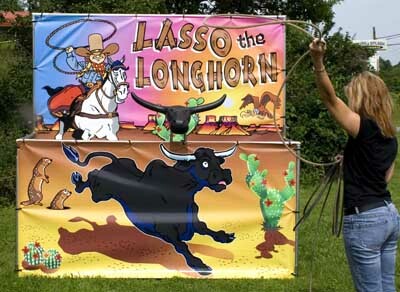 Each game comes with an authentic western lasso, colorful canvas, framework, bull's head and carrying case. At 7'x7', this game will be the center of attraction at your next event.